A security deposit is a sum of money placed with a landlord to protect against damages a tenant might cause to a rental property. It can also compensate for unpaid rent in some jurisdictions. Rules regarding security deposits make up a big part of Arizona’s landlord/tenant laws. What Is the Security Deposit Limit in Arizona? Landlords in Arizona can't require that tenants pay more than one and a half month’s rent as a security deposit, but a tenant can voluntarily pay more. The security deposit would be a maximum of $1,500 if the monthly rent was $1,000—one month’s rent ($1,000) plus one-half month’s rent ($500). So why would a tenant voluntary pay more? Arizona landlords are permitted by law to ask for rent in advance, such a first and last month's rent. This isn't actually a security deposit because the money is literally rent money, but it might be due at or before the time the tenant takes possession of the property. The tenant might be willing to agree to effectively pay rent in advance this way if he really wanted to rent the premises. Can a Landlord Charge a Nonrefundable Deposit? A landlord must state in writing that a fee or deposit is not refundable if that's the case. She must also explain the purpose of the fee or deposit. All fees and deposits which are not designated as nonrefundable are considered refundable. Typical nonrefundable fees include things like pet deposits against any damages that Fido might cause. The state of Arizona does not have any specific rules for where a tenant’s security deposit should be held. It doesn't necessarily have to be kept with a financial institution. In fact, the landlord is allowed to use the security deposit during the tenancy term to cover situations that have been spelled out in the lease agreement. But the landlord must have the appropriate funds available to return to the tenant upon tenant move-out. Is Written Notice Required After Receipt of the Security Deposit? The landlord is responsible for supplying the tenant with a signed copy of the lease agreement and a move-in form when she takes possession of the rental. The tenant will use the move-in form to write down any existing damages in the unit. Written notice that the tenant has the right to be present during the move-out inspection is also required. Is a Walk-Through Inspection Required? Arizona landlords must conduct move-out inspections. Tenants have a right to be present at the inspection if they inform the landlord of their desire in advance. The landlord does not have to allow the tenant to be present, however, if the tenant is being evicted and the landlord fears for his safety. When Can You Keep a Tenant’s Security Deposit in Arizona? 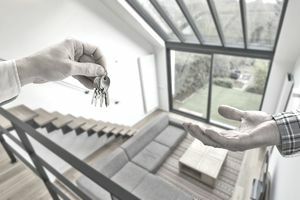 A landlord can keep a tenant’s security deposit, or a portion of the deposit, to cover unpaid rent, damage in excess of normal wear and tear, and other costs resulting from a breach of the lease. The lease should clearly spell out exactly what the landlord can take deductions for. When and How Must You Return the Security Deposit? Landlords in the state of Arizona have 14 days from termination of the tenancy to return a tenant’s security deposit in Arizona. These are business days—they don't include weekends or holidays. The deposit must be mailed by first-class mail to the last known address of the tenant unless the tenant has made other arrangements with the landlord or she's provided the landlord with a different forwarding address. The landlord must also include a written itemized list with the portion of the security deposit being returned if any deductions were made from the deposit following the property inspection. This written itemized list must explain the reason for each deduction and the amount being withheld for each repair or incident. Arizona tenants are expected to deliver written notice to their landlords that they're vacating the premises, including the date that they're vacating and a request to be present for the move-out inspection if appropriate. Notice can be hand delivered or sent by registered or certified mail. A tenant who hand delivers notice should make sure he gets a receipt. Notice can be in letter form, or you can easily download a "Notice of Intent to Vacate and Request for Move-Out Inspection Date" form from numerous sites online. The form might be preferable so you don't inadvertently neglect any detail. Just make sure it's specific to Arizona. Tenants should also request the return of their security deposits a few days before vacating, and they should do this in written form as well. A form is available for this as well, the "Request for Return of Security Deposit." The request should include a forwarding address, and it, too, can be hand delivered or sent by registered or certified mail. The new owner will become responsible for adhering to Arizona’s security deposit law and for returning the security deposit to the tenant if you sell your property. It's a buyer’s responsibility to make sure she receives all security deposits from the current owner. Arizona security deposit laws don't apply to the landlord's employees. This might include a property manager or maintenance person who lives on site and is entitled to occupancy as part of his compensation package. What Happens If You Fail to Follow the Law? Failure to adhere to Arizona’s laws governing security deposits can result in a tenant being awarded two times the amount of the security deposit wrongfully withheld, plus any damages awarded by the court. This might include attorney fees and court fees.